There are a few trends that are worth keeping an eye on at the moment. One of my favourites involves crafting materials. As Guild Wars 2 continues to progress, more and more legendary and exotic mystic forge recipes are being discovered. The majority of these look beautiful. Beauty, or appearance, is one of the key factors in game. So it's no surprise that this has an interesting impact on the trading post. Look at Molten Lodestones - they've leaped up in price in the past few days. They peaked at 1 gold each after lurking in the 20 - 30 silver range. At the time of writing they're steadily close to 60 silver each. What happened? Well someone (a player named Maisen) figured out the recipe for a pretty nice exotic greatsword - Volcanus - which required 250 molten lodestones. From there it was only a matter of time before the price spiked. Investors and buyers were jumping in with both feet. In a game where new recipes like this are going to be discovered for a month or more to come, and each of these recipes contain ingredients with minimal value (at this time) that you can snap up, it's not a bad idea to invest in crafting materials. Of course, you have to understand that an investment is a gamble. But even if you guess wrong you'll insulate yourself against gold inflation (gold will be worth less as more of it enters the economy) to some extent. I recommend finding materials (preferably rare) that are for weaponsmithing/artificing/huntsman 400 (used to craft the highest level weapons). I've already made one educated guess which I'll reveal in the comments below once we get a few good ideas from other posters. As always, share this if you liked what you read! Looking at the prices of Loadstones, I feel it's safe to say that investing in Molten Loadstones while they cost about 50s is a good investment if they follow suit and cost 1g+ like other Loadstones. Large Skulls are the way to go, I think (or rather HOPE ;)) they'll skyrocket just like giant eyes did. Good tips both - I'm looking at piles of putrid essence. 400 huntsman and artificer. Really, really cheap and not so abundant that a rush on them would be countered by a quick influx of farmed goods. I've already invested some of my funds. I can't shake the idea from my head that runes, sigils and potions aren't the whole story when it comes to these essences. The big downside to this investment is that they won't go into the mystic forge and they're not required for weaponsmithing. Caution advised (they're still a tip from me though). general tip... There is good money in longterm flipping for certain items/components. I start buying crafting materials from thursday and hold on to them for the weekend. I like coriander seeds, head of garlic, yam and stuff like those. The ones that have no determined nodes to farm them from (Vanilla). During the weekend the price of those go up by quite alot. I keep an excel sheet with the prices i bought them for and the minimal price i have to sell them for. I don't put them on the market if the price isn't near the price i want for it. Long story short, overpricing is quite expensive! And it also shows the danger of being undercut... That's why I try to only sell items at primetime, the longer an item is on the market the bigger the chance of being undercut. Agreed, selling items at primetime is critical to highest possible returns, hands down. I've just stumbled up on your blog and i have to say Thank You. 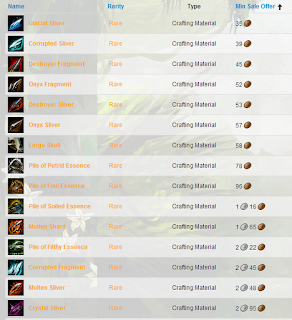 I was looking for a good Gold Guide for Guild Wars 2 and you really put everything together on HOW to make the gold. It really helps people to understand how to approach the Auction House in Guild Wars 2. Keep it up, since you provide alot of usefull informations. We want to see even more community contribution because THAT'S where the strength lies when you want to make a penny or two. A pretty effective way to make gold is to order lvl 60 rare weapons and put them into the forge. Every 4th or 5th item will be an exotic which will be the source of income, while the failed attempts cover at least 2/3 of your investment right now when sold on the trading post. While only about half of all items are above lvl 68 (and therefore dependend on the ecto price), all exotics have a chance to give you a good sigill. As of now, the price for lvl 60 rares is 4s and rising, from my experience so far it should be profitable up to 5s. Its a bit boring to click through ~100 items to buy, but otherwise its very easy and safe, because you are basically guaranteed to at least get your money back. Dont know how long it will be worth it, so i figured i share it. Hope it fits the topic and helps someone. Jesus H, I just tried this. 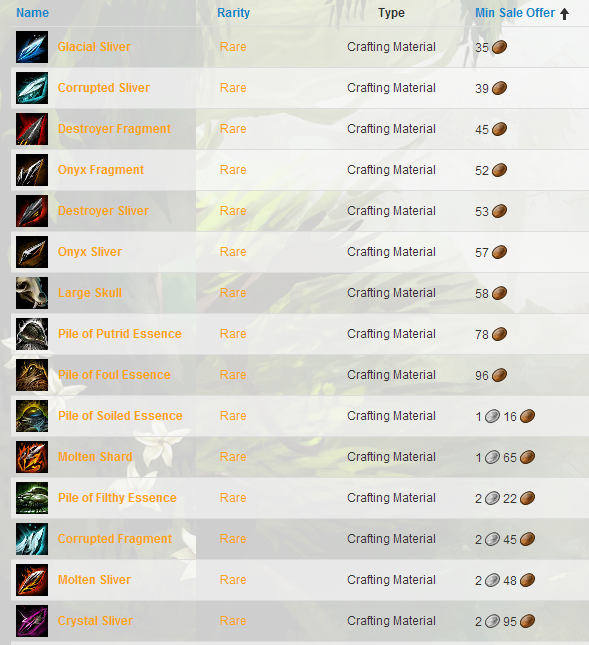 Bought 4 level 60 rares that varied in price from 4-5s, total about 18s. Put them in and got a rare back that I sold for 12s. Same ingredients second try, got an exotic I just listed for 1.9g. Brilliant. Thanks. Where is the educated guess? A bit further up - "I'm looking at piles of putrid essence. 400 huntsman and artificer. Really, really cheap and not so abundant that a rush on them would be countered by a quick influx of farmed goods." I really appreciate the guide and the posts you've been making these days though I disagree with your insight about putrid essences. Basically if you have one in your inventory and open the mystic forge it doesn't show up as an usable component. Yeah I noted that. It's a gamble but I'm of the opinion that they're just the kind of thing that will be used in spooky recipes (like Halloween). 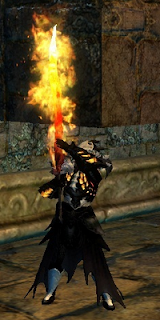 If they were mystic forge mats it'd be even better and who knows anet may add recipes that require them. They're a really undervalued 400 craft mat.